Broken wiring and insulation and counterfeit plugs. Those were some of the faults found by Telford & Wrekin Council Trading Standards Officers in a recent check of second-hand electrical products for sale. With the help of a specialist engineer, officers have just completed a series of inspections of second hand electrical appliances at shops across the borough. Where electrical faults were found, the items were removed and the traders were advised of their responsibilities. Officers also seized and suspended from importers quantities of non-compliant new electrical equipment – including ‘hoverboards’. This week is National Consumer Week 2016, which is focusing on getting consumers 'Switched On' to their rights and product safety when buying electrical goods. It also aims to educate businesses about their legal responsibilities when selling electrical goods. 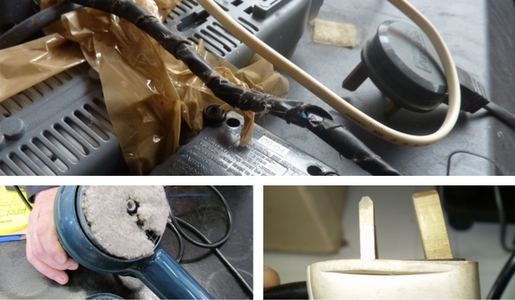 Pictured: Mains lead on fish aquarium repaired with duct tape - access to live parts and electrocution risk, air vent clogged with dust – fire hazard and damaged earth pin on mains plug.